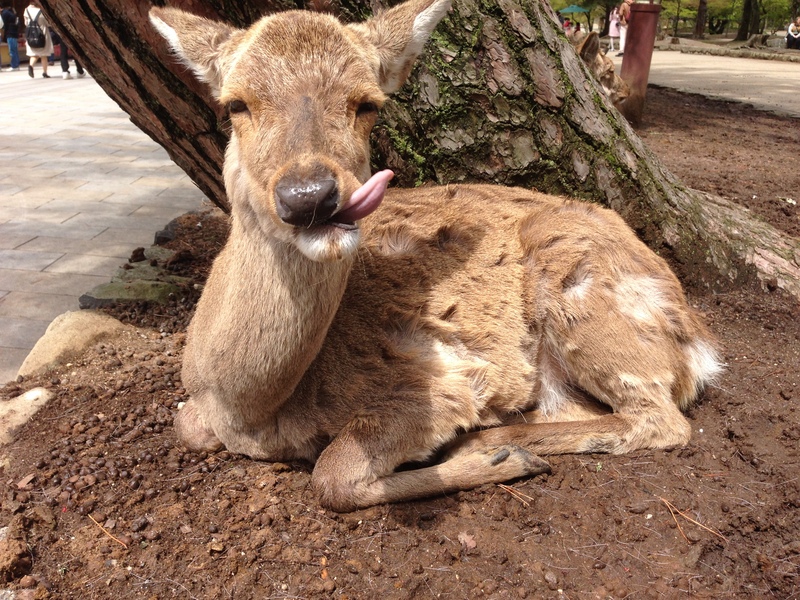 The only attraction in Nara bigger the giant Buddha are the deer. 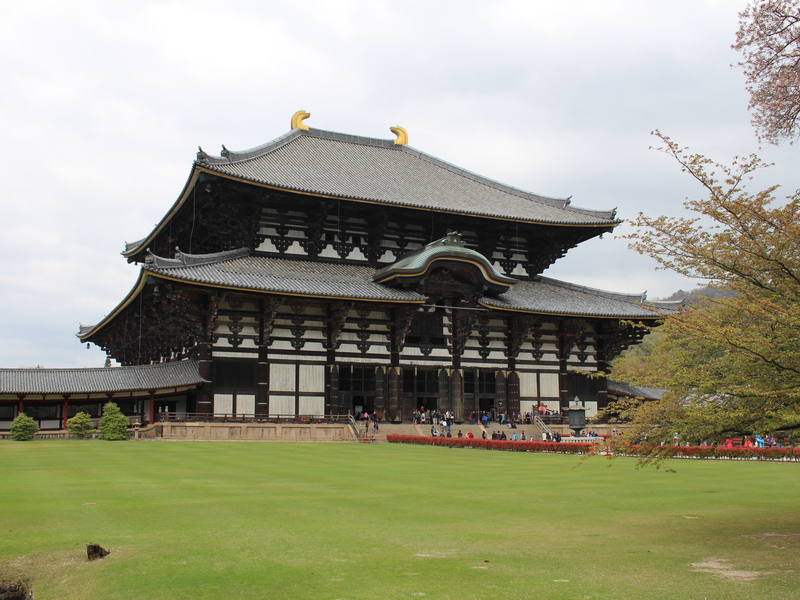 Once the capital of Japan, Nara continues to be a popular place visited by international tourists and locals alike. It has several UNESCO World Heritage sites, and is home to a huge deer population. 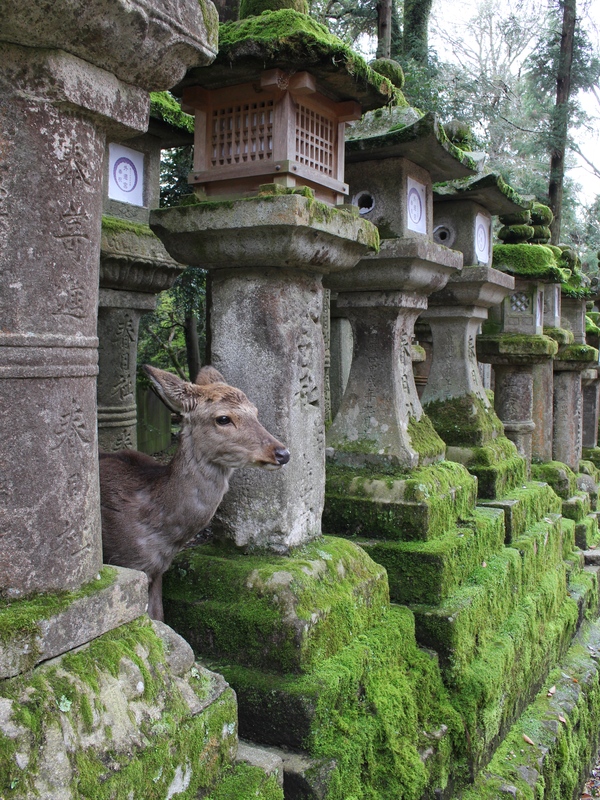 UNESCO World Heritage sites I am familiar with, and shrines and temples I was prepared to see, but I was a deer in headlights about Nara’s deer. Excited about escaping the Osakan metropolis in exchange for a day trip into nature, Simon and I had barely stepped foot onto the grounds of Nara Park when we spotted them. It wasn’t just one, two, five or ten deer, nor were they just a random sighting. They were here, they were there; oh dear, the deer were everywhere! 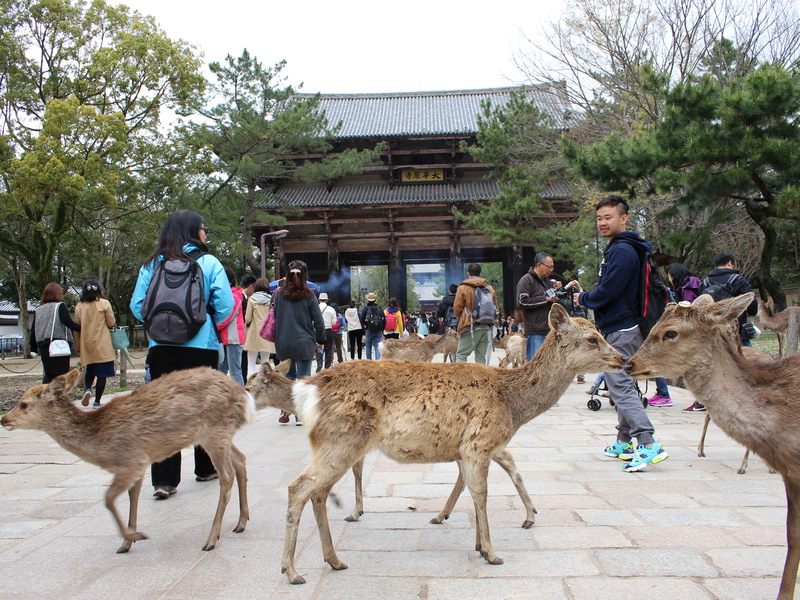 Legend has it that a mythical god arrived to Nara on a deer, and since then, they have been regarded as heavenly creatures. They are allowed to roam free in the park as well as the city. They were surprisingly docile, and didn’t even bat an eyelash as Simon and I attempted to take multiple deer selfies with them. After spending a ridiculous amount of time chasing them around and snapping photos, Simon and I finally visited some of the temples and shrines at the park that we originally set out to see, even if it meant foregoing lunch. 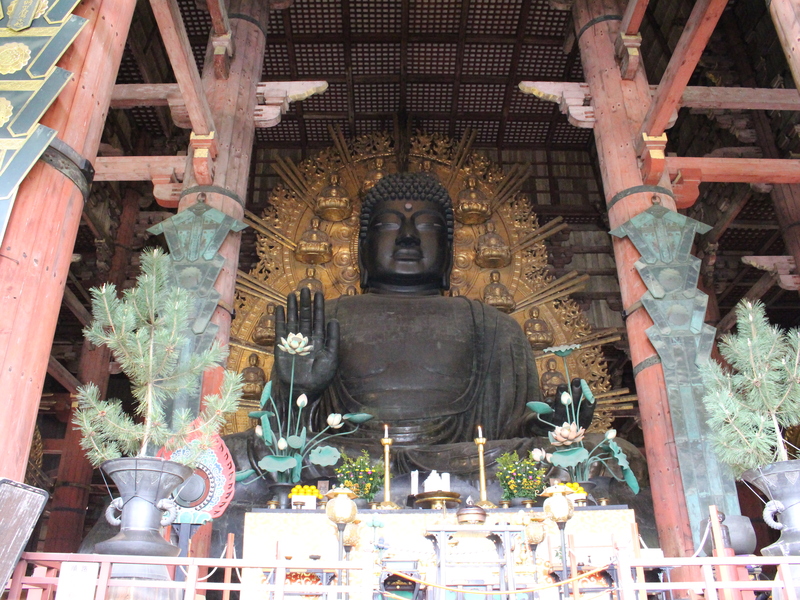 We felt humbled and tiny in the presence of the giant Buddha in Todai-ji (Eastern Great Temple), who’s enormity cannot be captured by my amateur photos. I’m pretty sure Simon and I would fit in the palm of the Buddha’s hand, and then some. What’s more impressive is that the current temple that the Buddha is housed in was actually rebuilt several times, each time smaller than the previous version. I can’t even imagine what it was like to walk the enormous grounds of the original temple. 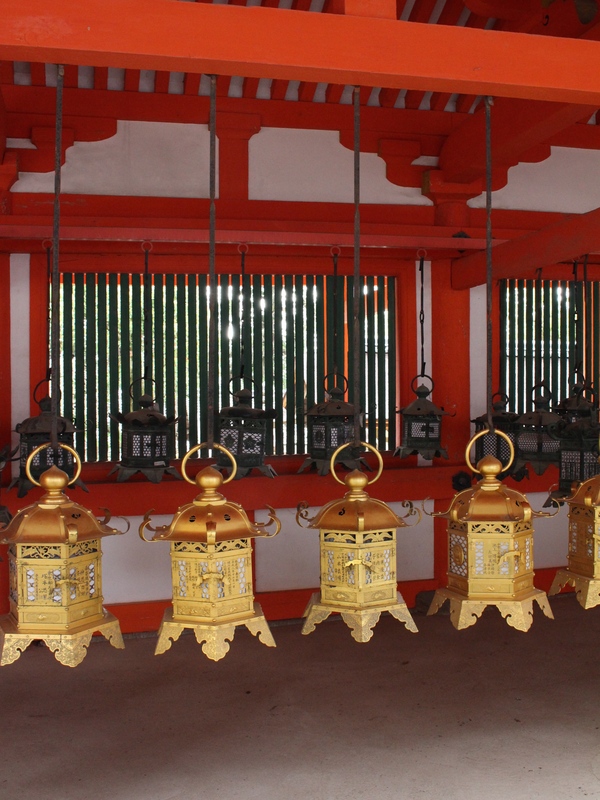 Another popular shrine in the park, and one of my favorites, is the Kasuga Taisha, with its countless stone lanterns donated by worshippers. 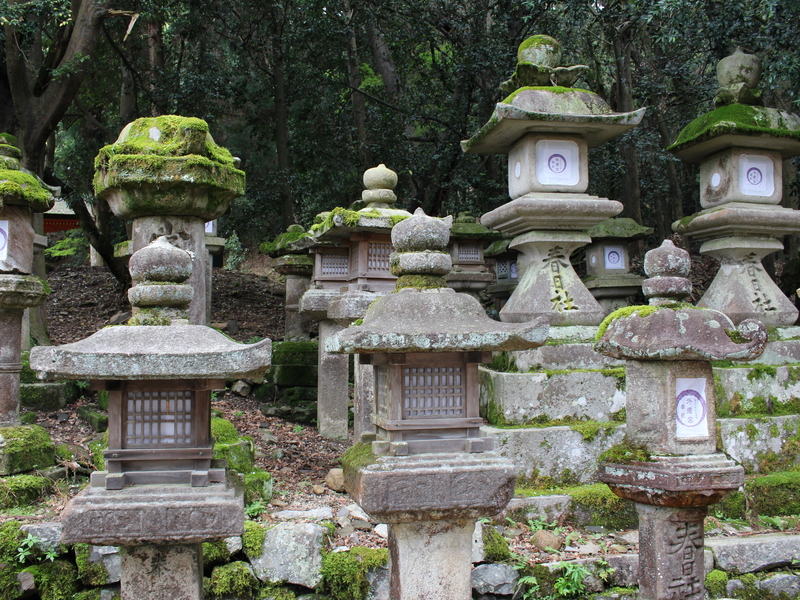 Rows upon crooked rows, stacked on top of each other in alternating shapes and sizes, the moss covered lanterns surrounded the shrine and lined the pathways leading up to it. Like stone soldiers frozen in time, their prolific presence added to the shrine’s awe inspiring grace. We walked all around the park, never stopping to rest or eat. Before we knew it, we were tired, hungry, and it was time to catch the train back to Osaka. My dear and I fell fast asleep on the ride home, all the while dreaming of deer.